Do you realize there’s just NINE more Monday’s until Christmas? That’s nuts! This time of year is super busy for us. We have 3 birthdays within the next 30 days and it got me thinking that I should really put together a list of things the 'traveling family' could use for Christmas or Birthdays. As you may already know, those of us living intentionally tiny have to really consider every purchase. Will we use it often enough to be justified? Does it have multiple uses? Does it have an easily redeemable warranty? These are just a few of the questions we ask ourselves when purchasing any item to use in our Airstream. We have been asked over and over again, what do you do for gifts? So, I’ve come up with some ideas that any traveling family could use. Now, I can’t stress enough how important communication is about gifts. 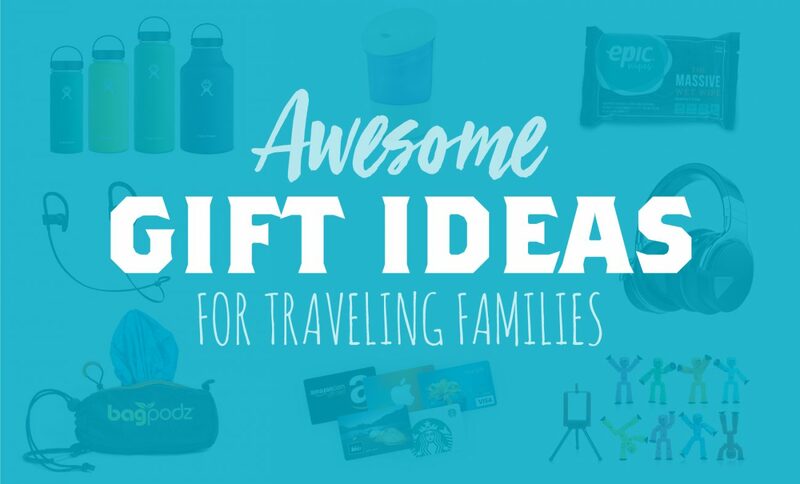 These are just suggestions, but if you’re buying for someone who travels full time or lives tiny, I highly suggest you ask them if it’s useful for them before buying a physical gift. There have been many times we’ve gotten thoughtful gifts that we would have loved to keep, but just had no room to store them. So always make sure you ask the recipient if it would work, or make sure you include a gift receipt. Please don’t be offended if they don’t keep the item gifted. Living in a tiny space is very challenging and anything extra that isn’t being used is just taking up valuable living space. So, what's at the top of my suggestion list? So many people think gift cards are the easy way out, but we think they’re wonderful. They take up hardly any space, and they’re super useful. Recently we received gift cards for Starbucks (thanks Mimi and Papa) and the kids loved it. They each got their own card (which can also be added to their app on our phone so we don’t have to worry about loosing them) and it’s something super special to them. We don’t go that often because lots of times we just aren’t in big cities that have Starbucks. But when we do get to go, it’s a treat and it totally makes their day. REI Gift Cards are another great option. I could seriously spend hours looking around there. Yes, their clothes are expensive but…THEY LAST. When you use it nearly every day, it’s worth it to have clothes that can hold up for the wear and tear we put them through. Just recently we spent around $650-$700 on new jackets for everyone. It was super painful to spend that amount of money - but they’re light, they’re really warm, they don’t take up much space, and we use them often! The fact that they all pack up so small was the selling point for us. We can easily stuff all of our jackets into one small hiking pack! It’s awesome. More than anything, REI has a great policy on their items. We have two REI chairs (they also pack up really small) and they have a lifetime warranty on them. If they break, we take it back to REI and they give us a new chair! They have so many items for adventurous families, you can never go wrong with an REI gift card. Visa gift cards are a great option. We’ve used them for gas and groceries and have been so thankful when we get a Visa gift card because we can use it just about anywhere. Who doesn’t love Amazon Gift Cards? I mean, come on. We still have our Amazon Prime membership and it has saved us so many times. It’s a membership we will not be without. I mean, when you run out of Coconut Coir for your composting toilet, you are so thankful that you can get it shipped in two days! Trust me, life saver. As our kids are getting older, they’re more into music and games and movies. A gift card for iTunes lets them choose what they want to get with the money. We have switched to just buying our music and movies online because we don’t want to have to store DVDs or CDs. We just don't have room to keep them. This is at the top of our list this year. We hope we can get the kids wireless noise canceling headphones because there are way too many wires in my life. They get all tangled up, and they’re just super annoying. Of course Bose are the best of the best but I can’t justify spending $350 on a set of headphones. That just seems crazy to me. However, these are just a fraction of the price and seem to be pretty great based on reviews. Jon also picked up a pair of Powerbeats3 Wireless In-Ear Headphones and loves them for their tiny size, long lasting battery and the Apple W1 chip makes it super easy to switch between his MacBook Pro, iPhone and Apple Watch without the normal Bluetooth connection headaches. Great for working out, too. Holy Cow!! Have you tried these wipes? I talked about them in this post and honestly, I can't even explain how great they are. When water is not readily available, we have to get creative with personal hygiene. These wipes have been so great for keeping us clean and smelling great. Anyone who loves adventure, camping, or have kids that don't love baths...these are for you! It wouldn't even be a bad idea for everyone to keep a box on hand in case of emergencies. I highly recommend you keep some in your go-bag, hiking pack, or supply closet. You never know when they'll come in handy. Now, this would only be if you knew that the person you’re buying for LOVES oils. I recently bought this exact 12 volt oil diffuser and we love it. This is one that is you’d have to take with the recipient about. For example, we still use our Costco Membership even though we have a tiny fridge and not a ton of storage for big bulk items. There are a few things that we get regularly so it’s worth it for us to keep our membership current. I mean, even being able to go to a Costco for a quick meal on a travel day is awesome. We bought a pizza and 2 drinks for just under $12 and fed our family of 6. I mean, that right there is worth the membership. Boondocker’s Welcome has been, hands down, the best RV specific membership we have paid for over the last 2 years. Just $60 gives us 3 years of benefits. We have stayed at so many homes through this membership and it has been wonderful. We have met so many sweet people through Boondocker’s Welcome. It’s the only RV membership that we wouldn’t be without. Bottles and cups are a weakness of mine. I know we have too many, but we do use them so it’s hard for me to decide which ones to do without. Anyway, our Hydroflask water bottles get used daily. We take them in the truck, we take them on our hikes, I use mine all the time. We recently bought 2 of the new flip top lids and LOVE them. I would love to get one for each of the kids to have their own. Right now we’re all sharing but with all the awesome color options they have, I would love to let the kids pick out their favorite. It’s another big ticket item but they also have a great warranty with their product so it’s worth it for the assurance that they’ll take care of it if anything happens to it. I’m not sure how you can damage them though. We’ve dropped ous down the side of a mountain in Sedona, and I’ve dropped mine several times just getting out of the truck. It’s a bit scratched up but not damaged. These things are robust, but storage is an issue. Make sure that the person you’re buying for has room to store them! We realized that once we made it out to California this year we HAD to have a reusable bag solution. We have been using BagPodz for awhile now and I can fully recommend them to you. They don't take up much room in the truck which is a big bonus. We have two sets. One set with 5 bags and one set with 10 bags. They hold a lot of weight, and they're eco-friendly. We can easily put a weeks worth of groceries into the set of 10! But I don't just use them for groceries...oh no! We take them into the laundromat with us and it makes dividing clothes so much easier. You get a bag, you get a bag, everyone gets a bag!! All the bathroom towels go into one bag, and the kitchen towels go into their own bag. It's been great to have them divided and easier to transport from the laundromat back to home. Besides iPads (which has been great for each of them to have their own), the next toy that is their go to is the small Halo figurines. I can't tell you how much I love stepping on all their little parts that end up on the floor (eye roll). But seriously, it's one toy that they all love and all play with together. Legos are a great option for traveling families, however...we didn't keep any of our Legos. We had them when we still lived in the 5th wheel but once we moved into the Airstream, space was so limited that the kids decided they'd rather have the Halo toys than the Legos. So, it's one that a lot of traveling families have, but for us, it didn't work out with our storage solutions. On a recent trip into Target, Jax spotted these Stickbot things. It's this posable guy with suction cup hands and feet. He's spent several hours playing with it and now all the kids want their own. They're so great for the aluminum walls we have, too! You can even download an app to make a stop motion video with them. Pretty cool. So, there you have it! These are what we feel would be great options if you are buying for a traveling family (or a minimalist family). For those of you who live tiny, or travel full time, what do you think? Let us know what you favorite gifts are for receiving on the road. One more thing. Did you know we have a curated adventure store right here at Tiny Shiny Home? The Nomadventure Shop is chock full of stuff we use and love and think rocks. Check it out for tons more ideas.